Bronze Spider Mums are spectacular flowers with long, tubular outer petals showering out of a bulb-like center. 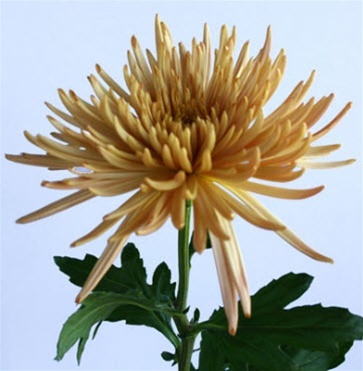 Spider Mums come in 10-stem bunches. They are favorite flowers for wedding bouquets and table arrangements. Free shipping! If you care properly for your Wholesale Spider Poms, they should last at least a week in the vase. Proper flower care begins with the timing of your delivery. We recommend you schedule your flowers to arrive 3 days before the actual event. Lilies should arrive 3 to 5 days prior to allow for opening. For a Friday or Saturday wedding your flowers should be delivered on the Wednesday before. Normally they will arrive before 10:30 am, depending on your service area. Since your flowers will be shipped direct from the farms, you will be receiving them at the same stage as a flower wholesaler. So they will probably look different than you are used to purchasing. After they have been properly hydrated and put into a state of suspended animation, they ship in dry packs (usually). It is NORMAL for your flowers to appear sleepy and thirsty on arrival. With proper care, they can last up to two weeks or more. A few hours after hydration, they will perk up and look dramatically different. 1. Carefully unpack flowers from box by cutting any straps. Remove packaging from the stems, but leave any plastic or paper covering the blooms for the first few hours while the flowers re-hydrate. Also leave the rubber bands holding the stems together for the first 4 hours or, if you wish, until you are ready to start arranging flowers. If you want to leave the packaging on the blooms, be sure to loosen it so they can breathe and not trap condensation. Spider Mums come in 10-stem bunches. They have a single bloom at the end of a stem that averages 20 inches in length. They're available year-round from our partner farms.